PT Industri Sandang Nusantara (Persero) - PT ISN is an Indonesian state-owned textile company. PT ISN was first established in 1961 as a spinning mill and weaving plant projects under the supervision of KOPROSAN (Komando Proyek-proyek Sandang). After several times change of the name and status, the name of PT Industri Sandang Nusantara (Persero) officially established in 1999 as a merger results of 2 state-owned textile companies; PT Industri Sandang I and PT Industri Sandang II. 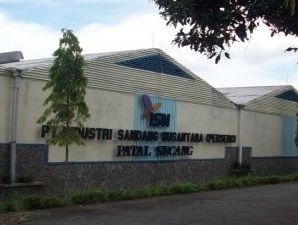 According to information found in PT ISN's company profile as cited by JobsCDC.com, PT Industri Sandang Nusantara (Persero) produced spun yarn, greige fabric, gauze, facial and medical cotton, garment and textile. PT ISN also engaged in textile trading business. PT Industri Sandang Nusantara (Persero) is based in Jakarta and its head office is registered at Jl Wolter Monginsidi 88 K, Petogogan- Kebayoran Baru Jakarta. PT Industri Sandang Nusantara (Persero) also supported by 1 operational office is Bekasi West Java and 7 manufacturing facilities at Bandung, Cilacap, Tegal, Magelang, Malang, Pasuruan and Makassar. JobsCDC.com now available on android device. Download now on Google Play here. Please be aware of recruitment fraud. The entire stage of this selection process is free of charge. PT Industri Sandang Nusantara (Persero) - Professional Hire PT ISN March 2019 will never ask for fees or upfront payments for any purposes during the recruitment process such as transportation and accommodation.